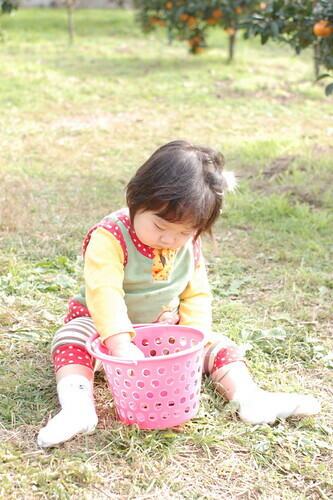 We went to a picnic with our friends last Sunday. It's getting cold now so I made a snood for Miyu. 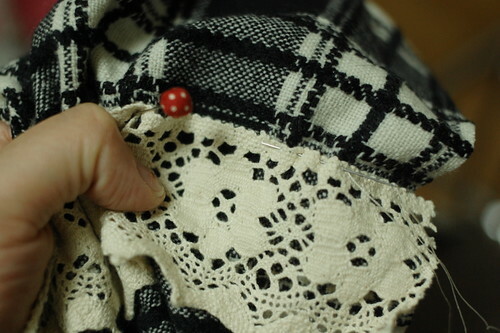 This one is very easy to sew. I show how I made it(* v *)!!!! 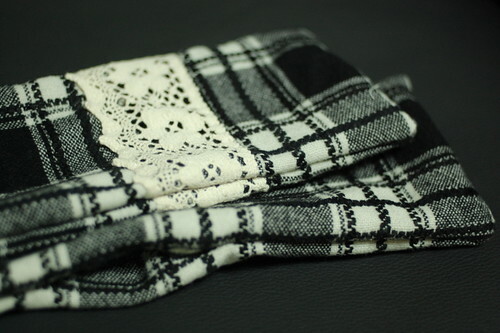 The snood measures 45cm (18 inches) long, 10cm (4 inches) width. So you need 47cm(19 inces) x 22cm(9 inches) piece of fabric. 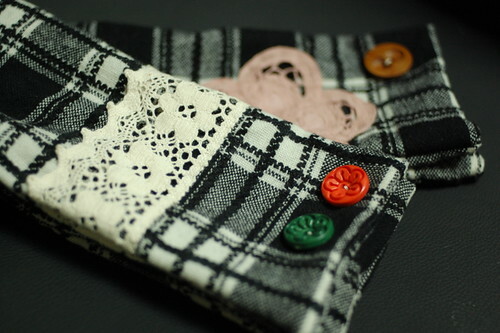 I used Japanese wool 100% fabric. You may also make it with fleece or flannel etc. Then choose the decorations. 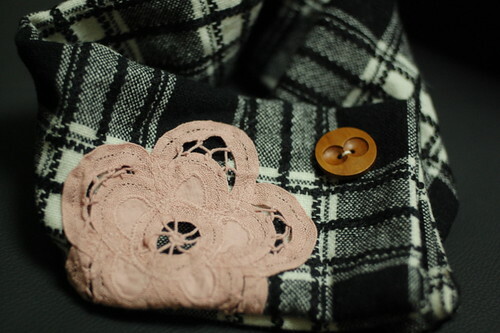 This time I put a piece of lace and two cute buttons. 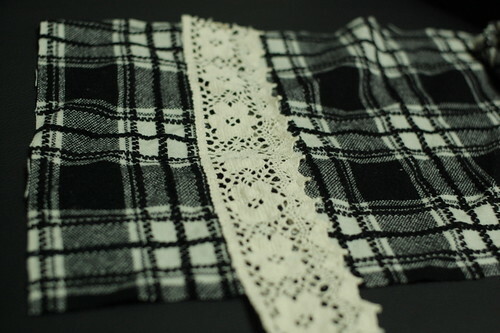 Let's begin with sewing the lace on the fabric. 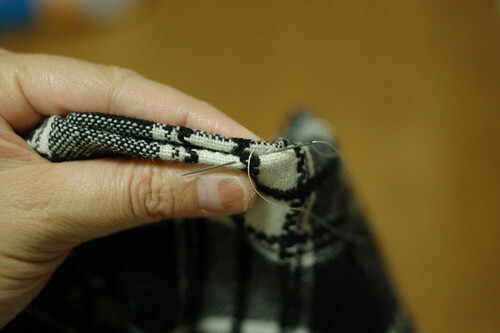 Fold it in two putting the right side inside, and sew it around leaving an opening to turn it out. Turn it out from the opening. Put a pair of snaps on it. And at last put the buttons. That's all! 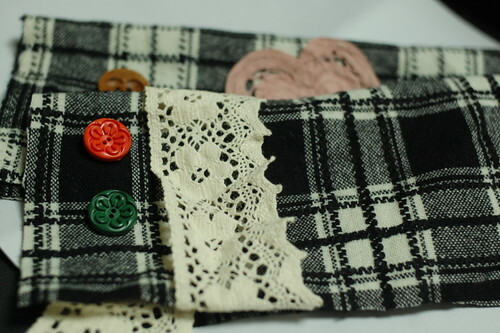 I made one more with a battenburg lace and a wood button. Enjoy easy sewing for your babies. Thank you very much for reading my poor explanation. If you have any problems for making it, please leave a comment here. Very nice. I think I will make one for my best friend and me for Xmas. Hello Mairuru!I like your blog and all the beautiful things you're making ! I just love the way you make everything look so easy! oh so cute! You really inspire me with your creations and you gave me the envy to sew again ^^ Do you always sew by hand, not using machine? My mom and I absolutely love reading your posts. Not only do you post such beautiful crafts, but we love seeing pictures of your family. We've been following your blog for quite a while now, a few months before your daughter was born in fact. While those buttoned scarves are very cute, snood usually means a net bag designed to hold long hair neatly. I love that you have found time to be creative with having such a beautiful little girl to take care of. I love the snood! Ignore that previous post - you can call it whatever you want! Love those eraser stamps too! Thanks for sharing all your great ideas! Thank you very much for your comments. 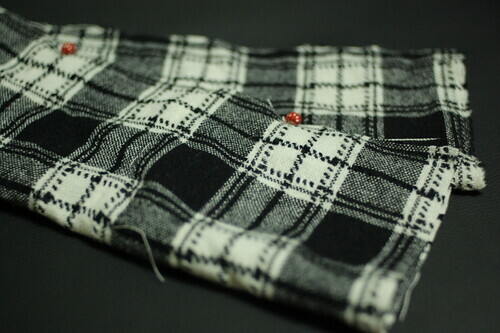 We Japanese call it "snood". I'm sorry for my poor English and thank you teaching me!!! Mairuru, thank you! I've been following your blog for a while now. I enjoy seeing your pictures and the posts. I think you explain things very well in english and what a great way to keep your language skills up! 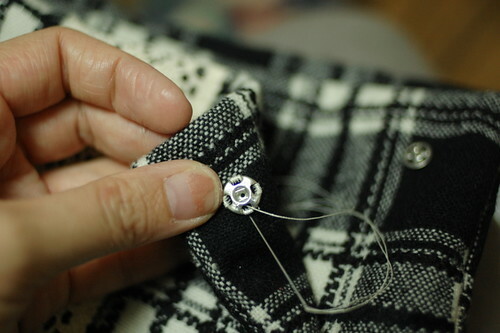 Your stitching is beautiful and I so enjoy the small things I've bought from you shop. So thank you for being so generous. 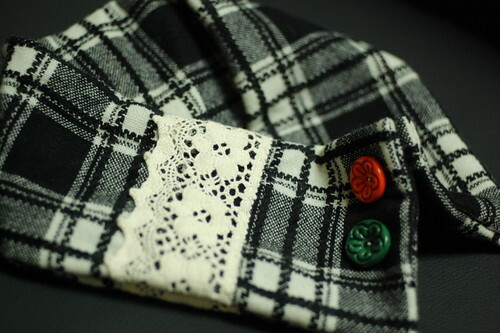 really beautiful "snood" for girl and mum ! Your daughter is now an real little girl ! Do you have Xmas time in Japan ? Happpy christmas, my dear. have a great time with your lovely baby and the rest of the family. Kisses from Portugal. Every visit of your blog leaves me with a nice warm feeling. Your projects are great and inspiring and your daughter is adorable. Wish your all the best in new year. Hi, I just found your delightful blog via Pinterest! Your daughter is adorable (I have a one-year-old daughter myself), and I really like your blog! Hugs from Finland! Dearest sweet mai, i love that gorgeous photo of you and your pretty baby! The snood look so adorable and i would love to make one too for my little doll. :) Have a beautiful week and love to you! Great post on How to make a snood for babies/kids..You made certain good points there, which i really liked it.. Great wprl! Hello, I am in a campaign on spread the word. I have this site UniformPoint.com that are handling different types of clothes from Uniforms, Shirts and Polos that we would like other to be heard. Beside from clothes they also have some bags, hats and shorts and more. If its ok with you, could you share this too? Thanks. Your work is great! I'm from Peru and I really like your page. Greetings!!!!! I love your mairuru blog! So wonderful to see a mom who loves the quiet handmade life and loves her family! Please don't worry if your precious little girl doesn't walk when other do. My oldest didn't walk until she was 18 months, and she is a musical genious, among other things. God has a plan! We all have kids in home and this is something useful that you have shared here for them. Thanks a lot dear. Awesome post that you have shared here. I value your written work abilities and all the learning that you have shared here.!! its a very beautiful art which you have shared here. i appreciate you. I appreciate to peruse this blog. Every single day your blog having some brilliant subject.